The Batman movie is apparently only "a year and a half out". That means we could be seeing the Dark Knight's solo adventure much sooner than we thought. So what might its official title be? 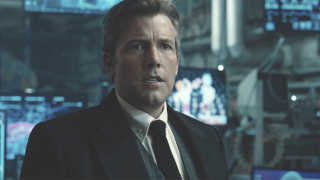 There's plenty of stories to pluck title inspiration from, as the character goes back a long way, but it seems that writer-director-star Ben Affleck is opting for a straightforward choice. Not the most exciting name but as he says, there's a chance it will change. The solo film is shaping up to be a jam-packed entry into the DC Extended Universe, that Affleck says will be much more of a detective story than Dawn of Justice. Hooray! Character-wise, aside from Affleck's do-gooder there's the villainous Deathstroke, played by Joe Manganiello. He's leading up the bad guy quota for the movie, giving the Caped Crusader trouble along with a potential army of other classic Batman rogues. On hand to help Bruce Wayne thwart their nefarious plans are JK Simmons, who reprises his Justice League role as Commissioner Gordon. Directed by Zack Snyder and starring Ben Affleck, Henry Cavill, Gal Gadot, Jason Momoa, J.K. Simmons, Amber Heard, Ezra Miller, and Ray Fisher, Justice League is currently scheduled for a November 17, 2017 release.